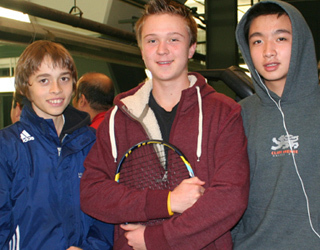 This year's event held March 2 - 4 at Van Lawn, Langley Tennis World, Town and Country, and Great West Fitness. Above photo, from left to right, Benjamin Sigouin, Tim Portnov and Mark Nguyen. Benjamin dominated his age category, winning with ease the Boys' 14 and, as for Tim, he is coming back after a long shoulder injury. Photo 1: Alexander Day lost to Todd Fought in the Boys' 18 final, 6-3, 6-2. Photo 2: Alexis Prokopuik , left, and her coach, Tracy Bennet. Alexis outlasted Stacey Fung in the Girls' 16 final, 7-6, 7-6. Citytv had a story on Alexis, which aired February 10. Photo 3: James Choi is helping Zack Lidster get up. Zack was cramping during their three hours match. James finally beat Zack in the Boys' 18 quarters, 7-6, 7-6, but came short against Todd Fought in the semis, losing 7-5, 6-3. Photo 4: Kamloops' Zack Lidster and his dad, Jerome. Photo 5: A group of Boys' 14 players, from left to right, John Schriemer, Manroop Gill, Jack Davis, Shant Mardikian, and Ian Brink. Photo 6: Kelsey King and her dad. Kelsey needed three and a half hours to eliminate second seed Saroop Dhatt in the Girls' 18 quarters, 6-7, 6-3, 6-4. She later lost to Vivian Tsui in the semis, 6-3, 7-5. Photo 7: Evan McNicol played a strong tournament. He eliminated the second seed Tim Portnov in the Boys' 16 first round, 2-6, 6-2, 6-2, and later topped Eric Fought, 6-3, 7-5. Evan lost to Felix Fan in the semis, 6-4, 6-4. Photo 8: Jack Karp and Sam Gouneili, left, lost to Benjamin Sigouin and Max Korkh in the Boys' 14 Doubles, 6-2, 6-2. Doubles were introduced in this year's Champ event. Our juniors don't usually get much doubles experience in BC so it was a refreshing opportunity. However, it came at a cost. Consolations were eliminated from the Champ event, to make time for the doubles!